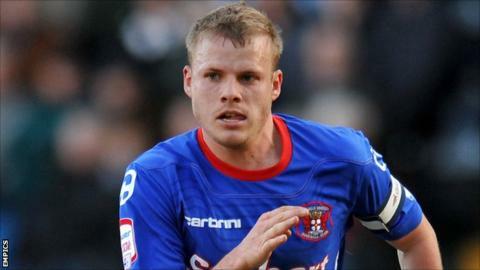 Carlisle United defender Frank Simek has signed a new one-year deal with the Cumbrians, keeping him at the club until the summer of 2013. The 27-year-old has been with Carlisle since his release by Sheffield Wednesday in the summer of 2010, and has since made 81 appearances. "Frank is another one we are delighted to have on board with us," boss Greg Abbott told the club website. "He has played some excellent football since he joined us." Abbott added: "He is a really hard worker who gives everything for the team." Simek, a United States international, has skippered the side in the absence of regular captain Paul Thirlwell, and played 25 of 46 league games for the club in 2011-12 after recovering from an early-season hip injury. Meanwhile Simek's team-mate James Berrett has said first-team football helped confirm his decision to sign a two-year contract at Brunton Park. Berrett, 23, has scored 20 goals in 103 games since his move from Huddersfield Town in the summer of 2010. "Playing regularly has been important for me," he told the club website. "I hadn't played much before I came here and one of the reasons for signing back then was because I felt there was a chance I would get some pitch time. "I think there's better to come from me and it's getting game time which helps you to develop."